Send SMS from your Windows Computer to any Mobile to any country in world with Free Bulk SMS Software presented here. This SMS Software sends SMS from your own SIM Card with the help of a 3G dongle or any leading company like Airtel, Vodafone, etc. There is no registration required and no API or online account creation is required. This Bulk SMS Application works on Windows 10, Windows 8.1, Windows 8 and even on Windows 7 and is really easy to use. 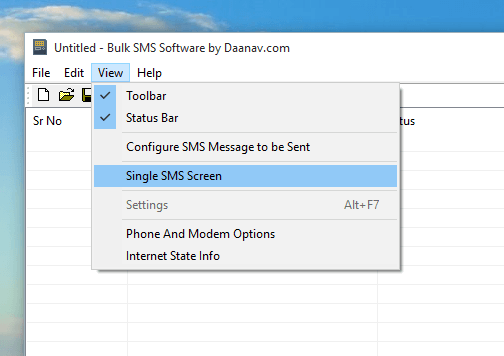 All you need to start sending SMS from your Windows PC is to connect your 3G dongle, start the software and start sending SMS Messages. The above screenshot displays a right click menu which allows you to control the Bulk SMS Software. Yes you can send English and Non-English SMS Messages, however non-English characters follow Unicode method and occupy double the data as compared to English characters. You can import a list of Mobile Numbers to which you wish to send SMS and then start sending SMS Messages. The Configuration settings do allow you to control the maximum number of SMS Messages to be sent in a day. The Number of SMS Messages sent by the software are displayed in the status bar of the software. The above screenshot displays how you can Import Mobile Numbers to which you wish to send SMS Messages from a text file. The Mobile Numbers must be present in the text file on every line and the file must be in Unicode. The best part of this whole SMS Sending Software is that you can save all your data in a SMS Profile File. Let’s say later you wish to find out the number of SMS Messages sent by this SMS Software or you wish to find out whether SMS Message has been sent to a particular number or not, the SMS Profile File can store all the related data allowing you to easily view the statistics and details of any SMS Session. The above screen displays the single SMS Message screen which allows you to enter the Mobile Number and your desired SMS Text to be sent to a single number. Do remember that although this Bulk SMS Software is Free to download and use, you will be charged by your Mobile Carrier for each SMS sent out. When sending SMS Messages to multiple Mobile Numbers, it is best to get an SMS Pack from your Mobile Carrier company like Airtel, Vodafone, Idea or any other Mobile Company so that you can save money on the cost of SMS Messages. Although sending International SMS should work fine, however this Free Bulk SMS Software is best suited for group SMS Sending with an SMS Pack so that the costs involved can be kept to minimum. Easy configuration, SMS Management, Error Handling and other features of this Free Bulk SMS Software does make this Application really the Best SMS Software. The underlying technology of this SMS Application does detects your USB Modem / Dongle Automatically and displays the Communication Provider name in the status bar of the application. Whether you wish to keep your customers informed about any event, send out Marketing SMS or any Informational SMS Message, this Freeware Application can be of real help. You must make sure that you do understand and abide by laws in your own country for sending SMS Messages. This SMS Software can send SMS Messages, however it cannot guess or understand your intentions and hence you are responsible for sending out the SMS Messages. To begin with, do follow the given below steps and send a single SMS Message to your own Mobile Number. Once you have completed the given below steps, you should be able to understand how to use this Bulk SMS Software and proceed ahead for sending out SMS Message in group. The given below procedure outlines the steps required to download, install and use this Free Bulk SMS Software and send a single SMS Message to your own Mobile Number. Once you have successfully sent and received a single SMS Message, you can proceed ahead and import mobile numbers from a text file and start sending a single SMS Message to a group of people. Plug in your USB Modem or Dongle and wait for Windows to detect it. Once Microsoft Windows does detects your USM Modem, you can proceed ahead to Send SMS Messages. 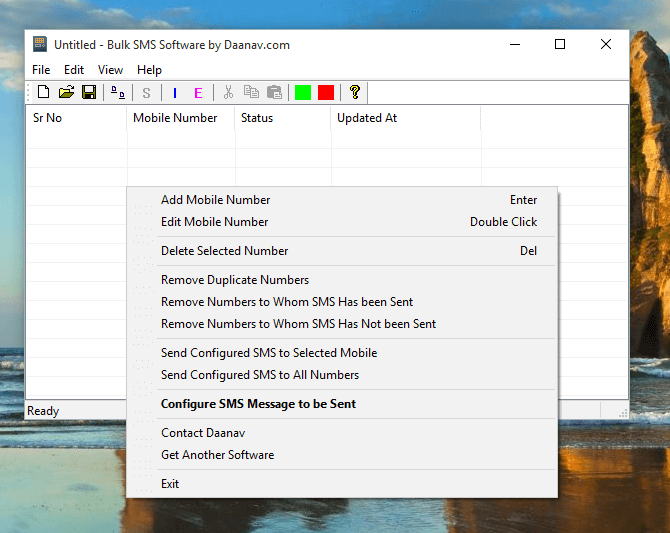 Download and Install Bulk SMS Software on your Windows Computer. Note that you must be running Windows 7, Windows 8, Windows 8.1 or Windows 10 Computer in order to use this Bulk SMS Software. Launch the Bulk SMS Software from Desktop Shortcut or from Programs Menu. It takes around a minute for the software to detect your USB Modem. Look closely at the status bar of the software which is present at the bottom of the software screen. The Bulk SMS Software should display the name of Mobile Company which is powering your USB Modem. The first screen of this post displays Airtel as the Mobile Services provider company name. Once the software has detected your USB Modem, you are ready to proceed ahead and start sending SMS Messages. In this procedure, we are going to send a single SMS Message, however by following along, you can easily send SMS Message to a group of Mobile Numbers easily and quickly. As displayed in the screenshot above, launch the Single SMS Screen from the View Menu of the Software. Enter your own Mobile Number, and the enter the SMS Text and finally click on the Send Button to command this SMS Software to send the SMS Message to your Mobile Number. Once you do receive the SMS Message, do carefully review the SMS Text sent by this Free Bulk SMS Software. You can follow the step 6 again to send another SMS Message to your Mobile Number or import multiple mobile numbers from the File Menu of the software. Whether you have a 2G, 3G or 4G USB Modem detectable by this software, you should be able to send SMS Messages with this Free Bulk SMS Software. Note that Sender ID of the SMS Messages would be the Mobile Number of the SIM Card inserted in the USB Modem. This SMS Software works on Windows 7 and later versions and works fine on both 32 bit and 64 bit Windows versions. All the SMS Messages are sent using the services of SIM Card inserted and the costs involved would be applicable as decided by the company providing your SIM Card. You do not need to pay money for using this Free Bulk SMS Software, although you can get the Software Promotion text removed by paying the required registration fees.